Fire features bring a feeling of warmth and social interaction to any backyard. 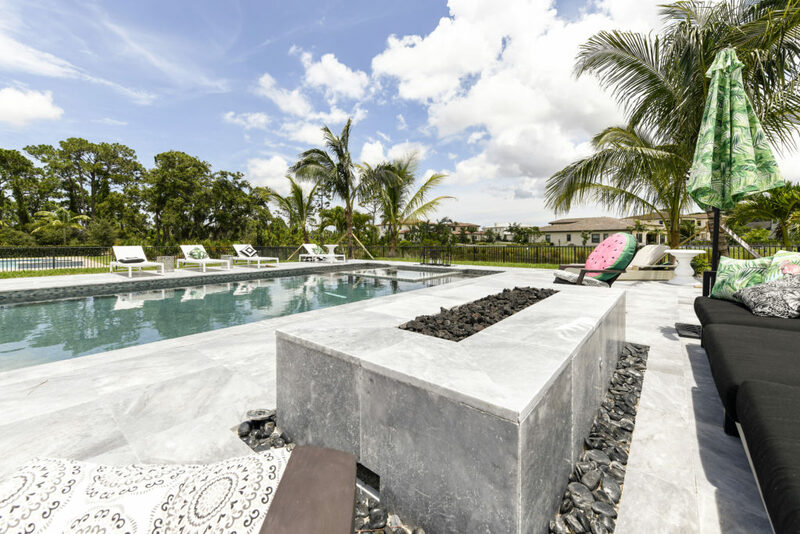 Fire Features are perfect for South Florida winter evenings. They create warmth and a cozy social environment in your backyard. There are several ways to incorporate fire features into your outdoor space, and we’ve listed the most popular below. Fire Tables: Shown in the image above, fire tables can be useful as they serve as a table when the fire isn’t active, and a beautiful fire focal point near seating areas to maximum enjoyment. Fire Pits: Reminiscent of a campfire, fire pits can be built in any size, above ground or below. Grab your marshmallows and warm drink, and cozy up next to a firepit. Fire Bowls: Fire bowls can be placed anywhere in the patio, and we usually build them near the pool area, flanking a spa. Our customers love sitting in their spa while gazing at the flame. Fire Columns: Fire Columns are typically placed at the corners of patios and pools. Columns are usually slimmer than bowls and pits, and are perfect for smaller patio areas. They’re available in different materials and finishes to match your decor. At Apex Pavers and Pools, we can incorporate these fire features into your backyard space. Contact us today to make an appointment with a design specialist.